DEVON under-15s said a fond farewell to coach Sam Wyatt-Haines by beating Berkshire in his final game. Devon totalled 214 all out in the last of their 40 overs at Shiplake College – Ben Beaumont top scoring on 80. Berkshire were finally bowled out for 132, but only after their last pair had kept Devon in the field longer than they expected. There had been heavy overnight rain, and whoever won the toss would insert the opposition, on a green-looking wicket with a heavy outfield. Devon duly padded up, as captain Joe Du’Gay called incorrectly. Jack Ford and new opening partner Taylor Ingham-Hill were the first to experience the challenge of facing a new white ball in this competition. There was early swing, and Ford edged to the keeper with the score on seven. A confident Elliot Hamilton, fresh from runs for Plympton 1s tXI, joined Ingham-Hill. Two shots for four were promising, but with the score on 44 Hamilton got a leading edge and was caught. Forty-four for two soon became 44 for three as Du’Gay was bowled without troubling the scorers, by the impressive Oscar Clark. Beaumont joined the resolute Ingham-Hill, and the pair set about repairing the damage. Batting sensibly, but positively, they put on 111 before Nelson struck in the 38thover, and Ingham-Hill was dismissed for 54. He had scored four fours in this patient innings. With 13 overs to go, the score was 155 and coaches were speculating on a 250-plus total. What followed was familiar to those who know this squad. Beaumont, who looked likely to score his maiden hundred for the county, was tiring in the oppressive conditions, and fell 10 runs later for an excellent 80. A further 23 runs were added for the loss of four more wickets, as Tyson, Reynolds, Farley and Baker all contrived to lose their wickets. It took a stand of 26 between Dylan Hurst and Charlie Ward to get the score above 200, Hurst falling to the penultimate delivery for an invaluable 20. Ward finished on 12 not out. Devon’s 214 looked to be 30 runs shy of the total that should have been posted, on a wicket that played much better than it looked. With the outfield drying, and quickly, the required rate looked within the opposition’s grasp. An early wicket for Charlie Ward, who bowled an important, and impressive, first spell of six overs, one for six, should have put Berkshire on the back foot. However, some loose bowling at the other end saw the score at 36 for one from eight overs. Hurst took a smart caught and bowled to break what looked a good partnership. Spin was immediately introduced, and the brakes applied to excellent effect. This team has nearly all the options, off-spin, left-arm and leg-spin. They used them splendidly. The next 26 overs were all spin, and only 61 runs were conceded for seven wickets. All bowled with control, well supported in the field. Hamilton had 2-33 from 10 overs. Josh Farley 2-17 from six overs of controlled leg-spin. 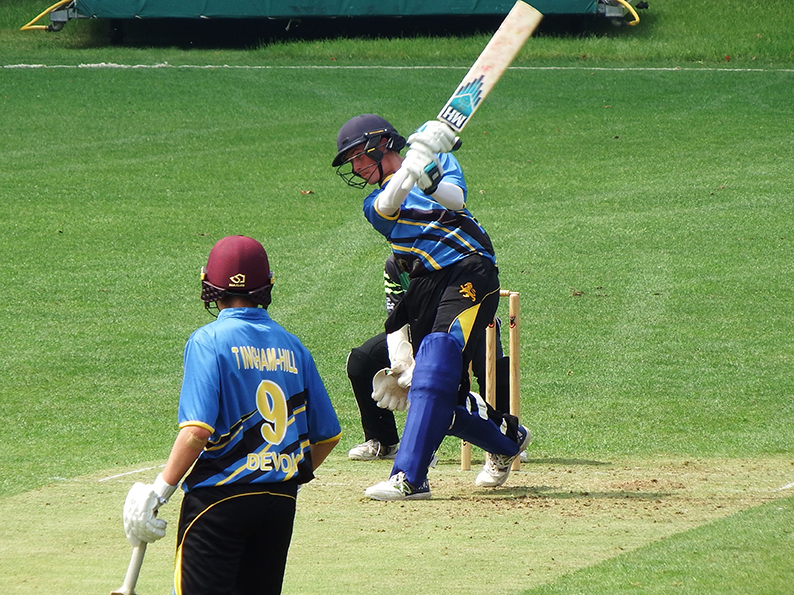 Ford contributed seven overs of off-spin with figures 2-13 and Ingham Hill followed up his batting with three overs for six runs. At 97 for nine the game looked over, as there were19 overs to go. The final pair from Berkshire –Ayran Sutaria and Karman Khanna settled in for some batting practice, and the Devon intensity level dropped. Suddenly, with overs to go the run rate was only just over 7 an over, and the home team were growing in confidence. Devon woke from their slumbers and switched on again in the field. A fine piece of fielding, and throw from the irrepressible Ingham-Hill saw the batter short of his crease, and a final winning margin of 82 runs for the Devon side. This was the final game as coach for Wyatt-Haines, as he is off to London to start his career in Law. Team manager Nigel Ashplant said: “Sam will be missed by all involved with Devon cricket. His enthusiasm, attention to detail and ability to inspire has helped all those he has worked with to improve their game. “What won’t be missed by some are his fitness drills during indoor winter sessions.